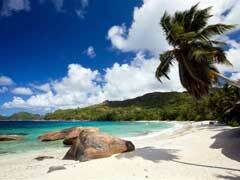 Seychelles Cruise - Which African Cruises Include Seychelles? Seychelles Cruise – Which African Cruises Include Seychelles? The Seychelles are an archipelago of 115 islands nestled in the Western Indian Ocean. A Seychelles cruise can take you to this wondrous republic where you can enjoy all that the islands have to offer. Located about 1,500 km east of mainland Africa, many Indian Ocean cruises will include the Seychelles in their itineraries. Oceania Cruises stop in the Seychelles as part of their 30-night Sand and Safaris cruise, which starts out in Cape Town and goes to Singapore. Oceania also offers 47 and 64 night cruises which leave Cape Town and travel to either Hong Kong or Beijing, while allowing passengers a day to explore the white sand beaches, pristine waters and island hopping adventures that await, just a few of the many things to do in the Seychelles. Princess Cruises, Costa Cruises, and Variety Cruise Lines also offer Seychelles cruises as part of their Indian Ocean itineraries. Cruises vary in length and go anywhere from a four night excursion such as Variety’s “Cruises in the Garden of Eden” up to a 106 night cruise from Costa Cruises which is dubbed the “Grand Cruise to the Other Side of the World”. These longer cruises allow you numerous stops where you can immerse yourself in the local cultures and traditions while only having to unpack your suitcase once. A Seychelles vacation will take you to an island paradise that isn’t as crowded as more traditional cruise destinations can be. The sprawling white sand and crystal clear waters are just one of the things to enjoy, but further inland you have monuments, nightlife, activities and various terrains to keep you occupied. Seychelles cruises promise the diversity and beauty that can only be found in this part of the world. While many cruises from Africa do include the Seychelles, you may also be able to stop there on Mauritius cruises, allowing you the beauty and customs of two interesting islands. A Seychelles cruise from Africa is in the part of the world where there is certain unrest at times and where the threat of modern day pirates is very real. Although cruise ships are relatively safe and secure, it is always a good thing to know what is out there, especially when travelling in the Indian Ocean and around the continent of Africa.